We treat your privacy very seriously! These travel hacks will save you some serious time. Travellers are becoming more and more sophisticated, so its great to see airport restaurants that offer a true taste of fine dining before take-off. Even the most seasoned traveller dreads an overcrowded airport. Check out our insider airport tips to make getting away a little easier. Going away this Christmas? We've scoured the UKs best airport bars for the top tipples available to thirsty travellers during December and beyond. Loss or theft of important items  credit cards, travel documents or mobile devices  is an uncommon but stressful occurrence while travelling. Avoid the hassle of losing something vital by following these 8 tips for keeping your belongings safe. Many hotel chains include in-room safe deposit boxes secured with an electronic code as standard; if your hotel room has a safe, use it to stash your valuables when you head out for the day. Passports, any cash you dont need, any jewellery youre not wearing and any electronic devices you dont need with you should all go in here. If your hotel has no in-room safe, ask the front desk if they can hold your valuables in a locked drawer. Its wise to keep cash, cards and any documents such as your passport or driving licence close to you when you travel  consider using a pouch or money belt worn inside your clothes, or use an inside jacket pocket instead of the back of your jeans. Watch out for holes in pockets that passports can fall through  it has happened! In the event that something vital goes astray, it will be a lot easier to replace your item if you have a photocopy, scan or even a photograph on your phone. Taking a picture of your passport, visa, driving licence or medical card will make the necessary information easier to report if you have to. Padlocks can be indispensable for locking luggage to luggage racks on long train journeys, locking valuables in safety deposit lockers if your hotel has no safe, or even locking hotel rooms (as is common in South Asia). 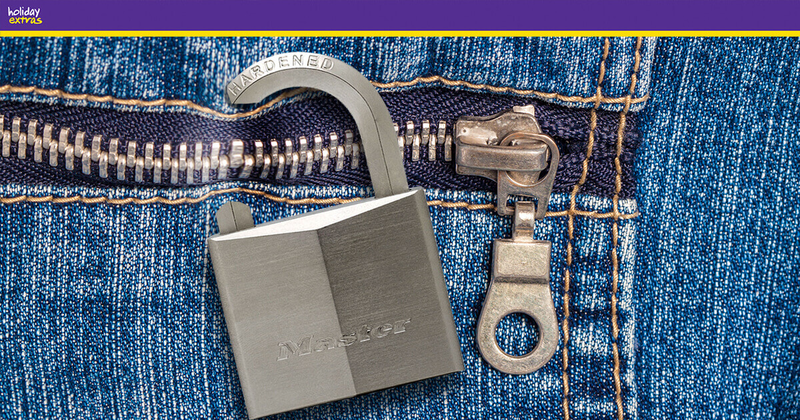 Bring your own secure padlocks  combination locks are most convenient as they dont involve keys you might lose. If youre travelling with a laptop, you might like to invest in a cable lock to keep it secure in public areas. Seek local advice online or in guidebooks about any known scams in the areas youre travelling to. Watch out for pickpockets operating in pairs (one distracts you as the other helps himself to the contents of your pockets); thieves posing as beggars with their hands concealed beneath a cloth or jacket; or (in very rare cases) strangers offering drugged beverages in order to make off with your stuff. Be especially alert after a night on the town  street criminals will target tourists who are the worse for wear. ...or all your cash, your cameras or your travel documents. Divide important and valuable items between your bags, and then if one goes missing you wont have lost the lot. Long queues full of bored people waiting to check-in or buy a train ticket are prime targets for opportunist thieves. Keep your belongings close to you, your bags zipped shut and stay alert while youre waiting. Report anyone loitering without good reason to staff or the authorities. If its heartbreaking to find a treasured item has been lost or stolen, imagine how much worse it would be to find that item isnt covered by your travel insurance. Check your policy before you leave, and make sure its valid for the areas youre travelling to and includes all the items you need with you. If you enjoyed this post like us on Facebook and follow us on Twitter or Google+. Written by Lise Smith, a former contributor to Lonely Planet's India guidebook - she's seen her fair share of hotel rooms (both grotty and glamorous!). She learned to walk in a hotel corridor in Tunisia, and at the age of three had been on more aeroplanes than buses. Lise writes for a number of local news, technology and arts publications.